Proper technique and mechanics for administering volleyball time outs. Whistle and step to the teams side of the net. Signal timeout. If the timeout is to the left, the left hand will form the stem of the T. The right hand forms the horizontal portion. Then point to the bench of the team that requested the timeout. The first referee repeats the timeout signal (photo at the right). The second referee will signal to the first referee the number of timeouts taken by each team. The first referee doesn't repeat the signal for the number of timeouts taken. The second referee will then begin timing the timeout (30 seconds). The second referee then checks with the scorer to make sure the visual score is correct and all the information on the scoresheet is recorded properly. Whistle and direct the teams onto the court. Even if time hasn't expired, if both teams have taken the court, whistle to signal the end of timeout. If the teams haven't taken the court and you've whistled the at the 30 seconds, step towards the team and encourage them to take the court. If necessary, you may choose to whistle again. Make sure the scorer is ready. Ensure the court is ready for play. 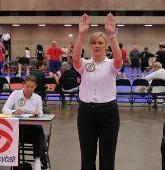 Give the court back to first referee by giving the ready signal.